You don't need a grinder and felt wheel in order to keep your knives, gouges, and c hisels sharp. 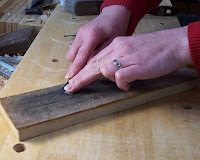 Honing with a leather strop charged with a fine compound also keeps them razor sharp. Glue a piece of leather to a flat substrate, like mdf or plywood, and rub a fine grit compound over the surface of the leather. I glued my leather rough side up, but others glue theirs smooth side up. Slide your knife away from you, with the cutting edge facing you, and keep the blade at the same angle as the bevel. Flip the blade over and pull it towards you, this time with the cutting edge facing away from you. This way you won't go uge the leather. Ho ne each side of the blade the same number of times. The lettercarving chisels that I've used for about 12 years have never once touched a waterstone or grinder. I have only ever honed them on a strop and they cut just as well now as the day I bought them. To sharpen a straight chisel, maintain the bevel angle as you slide the chisel towards you, with the cutting edge facing away from you. 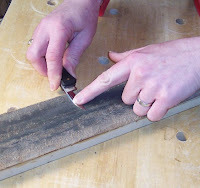 To hone the back, make sure the chisel is perfectly flat and then follow the same procedure. Always hone each side of the blade the same number of times. 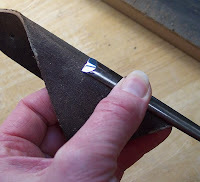 To hone a straight gouge, I use a Flexcut SlipSt rop, which has pre-formed shapes that match many types of gouges. Charge this with compound and hone the inside of the blade in the same manner as above. 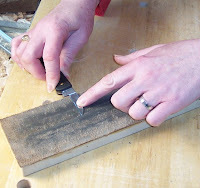 Hone the back of a straight gouge, if the sweep is not too extreme, on the flat leather strop, and rock the blade to match the back of the bevel. I lean the blade to the left and slide it, then lean it in the middle and slide it, and then lean it to the right and slide it. All the same number of times as I hone the inside sweep. For smaller gouges, I sometimes use a piece of leather that I just bend by hand into a curve that matches the inside curve of the gouge.